The last time I attended a meditation class, I was captivated by the fancy cushions and chairs being used by my fellow meditators. I also noticed that these folks could hold various meditation poses like pros. As a meditator, I can totally relate to numbing ankles, an aching back, and a fidgeting lotus position. If you are someone who loves to meditate but fears sitting on the hard floor for hours, meditation cushion is your answer. I have compiled a list of 9 best meditation cushions to help you start a healthy lifestyle. Take a look! 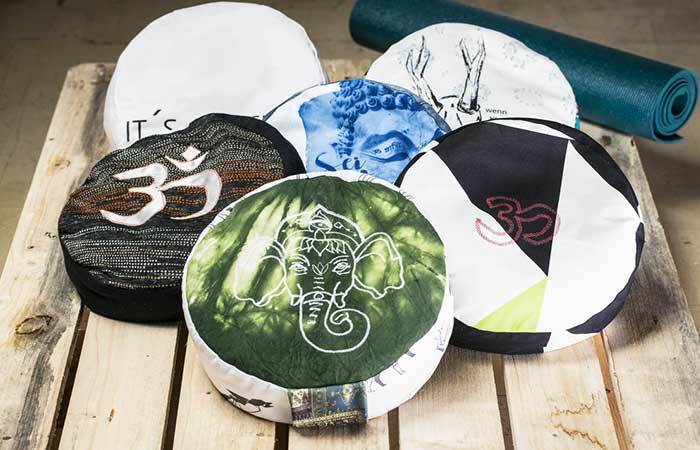 Seat Of Your Soul Meditation Cushion lets you meditate in peace by providing total comfort. It deepens your experience by keeping a check on your stress levels. The unique design allows you to sit raised off the ground for the perfect meditation position. It helps you avoid straining your back as the cushion aligns your spine perfectly. The shape provides excellent support to the hips, lower back, and thighs. Since the cushion contains buckwheat, it contours according to your shape as you sit. 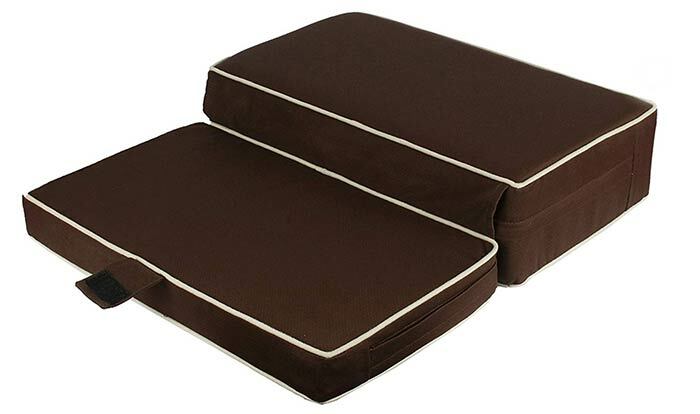 This set includes a zafu and zabuton that facilitate a comfortable position for stress-free meditation. 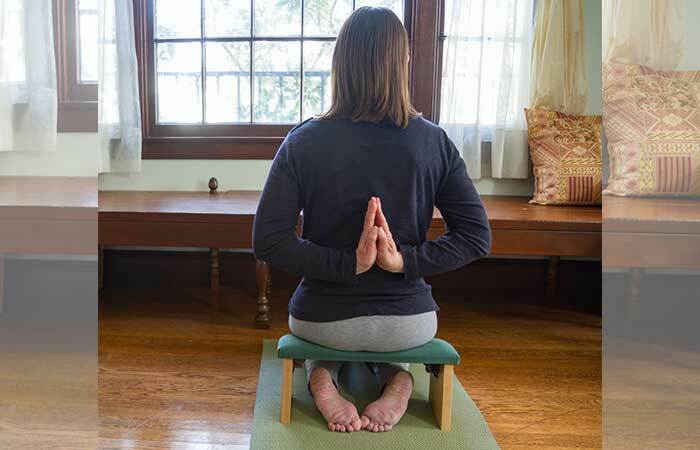 It provides the best seating height while reducing stress on the knees, ankles, lower back, and hips. The zafu meditation cushion, combined with the 100% natural large cotton zabuton mat, lets you rest your ankles, preventing them from numbing after sitting for long hours. This cushion is designed for comfort and portability. It is a lightweight travel meditation mat that has separate adjustable chambers embedded for stability and comfort. 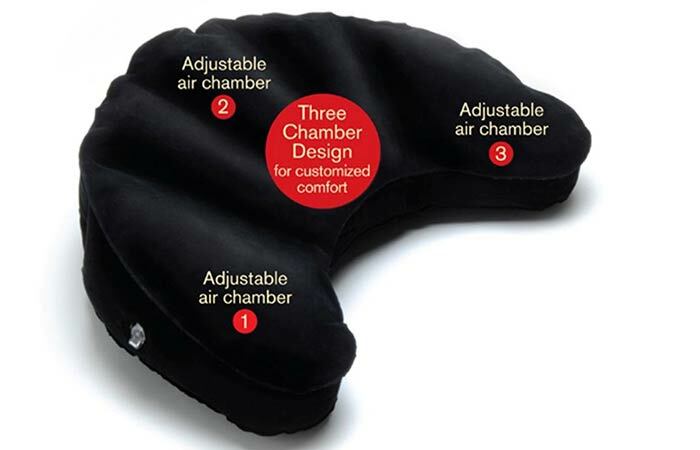 The three inflatable chambers allow optimal spine support and pelvic tilt. Fill in some air, meditate, deflate it quickly, and carry it in your bag. This simple yet effective meditation pillow is a perfect product for travel enthusiasts. Possibility of air leakage after 4 to 5 months. 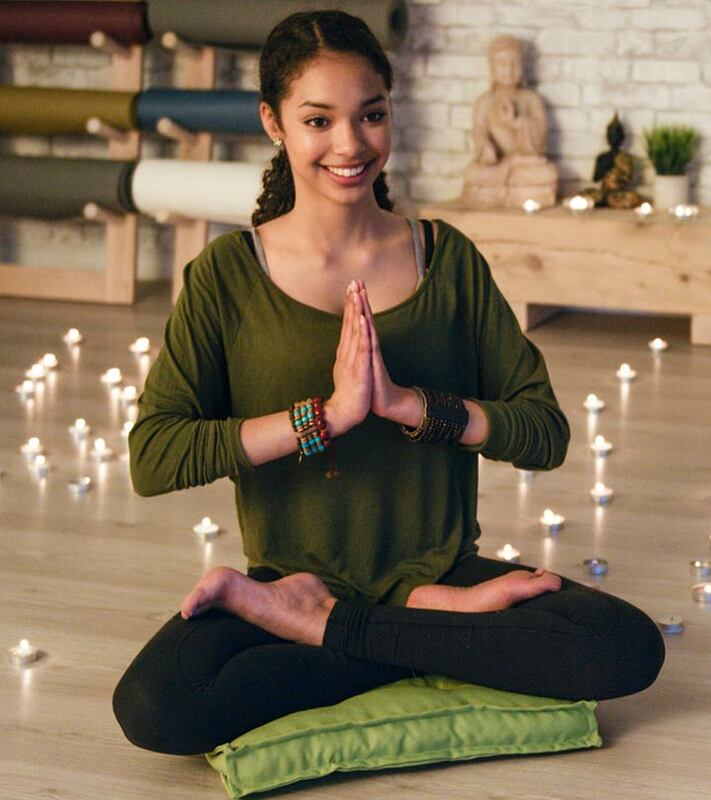 Find centered stability while you meditate with the Peace Yoga Meditation Cushion. If aching bones and benumbed ankles interrupt your meditation, this is the right product for you. 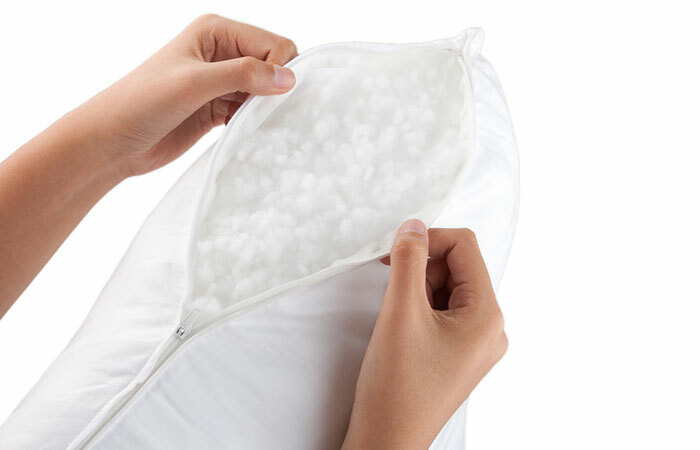 The cushion is tightly packed with buckwheat hulls that impart the perfect balance of firmness and softness. It provides bedding and relieves stress from your knees and hips. 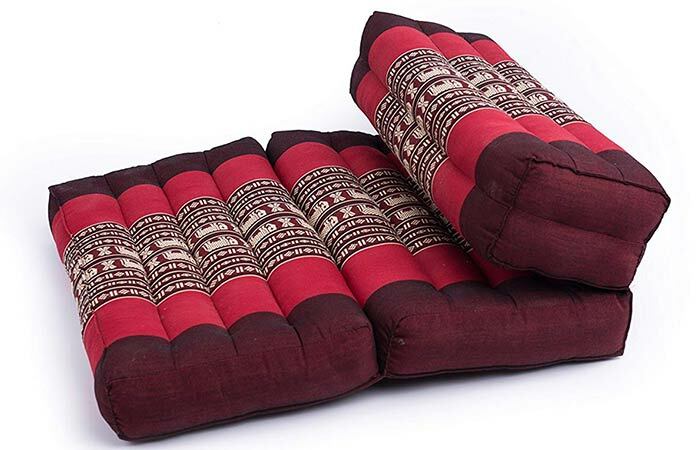 Quit adjusting your position during the meditation with this amazing cushion. This meditation bench is made from lightweight acacia wood with a comfortable cushioned seat. It is sturdy and non-foldable and measures 18″ long and 8 inches wide. It allows you to sit a few inches above the ground for the perfect meditation position. It relieves lower back stress and keeps your posture aligned. Not as sturdy as it claims to be. This cushion has three foldable parts for perfect support. 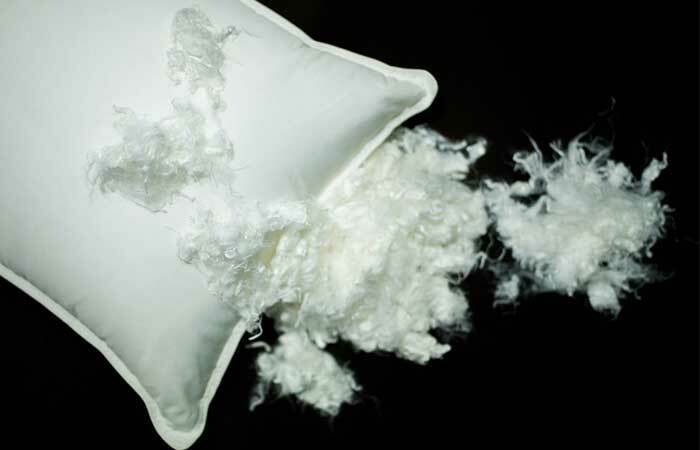 It is a double stitched cushion made with 100% kapok stuffing. The material is light, hypoallergenic, environmentally friendly, and very buoyant. 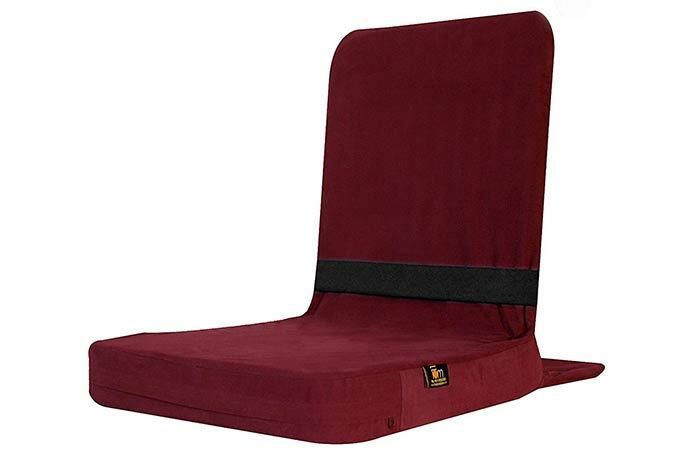 Its firmness can help correct your posture, unlike other foam cushions. The ergonomic design allows you to adjust the height while you rest, raise the hips, and stabilize your position. This ergonomic design supports your lower back, ischial junction node, knees, and feet, giving you the perfect lotus position. It relieves muscle tension and provides bedding for sore ankles. It prevents tear, joint pains, and bone pressure and simultaneously boosts concentration. 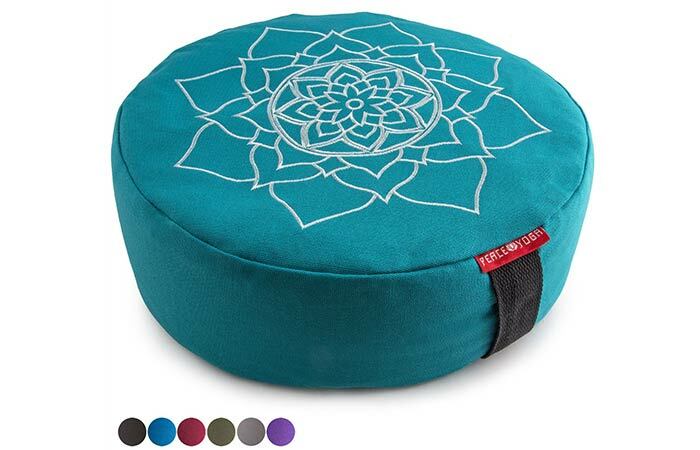 This fabric finished neoprene foam meditation seat comes in seven beautiful colors. 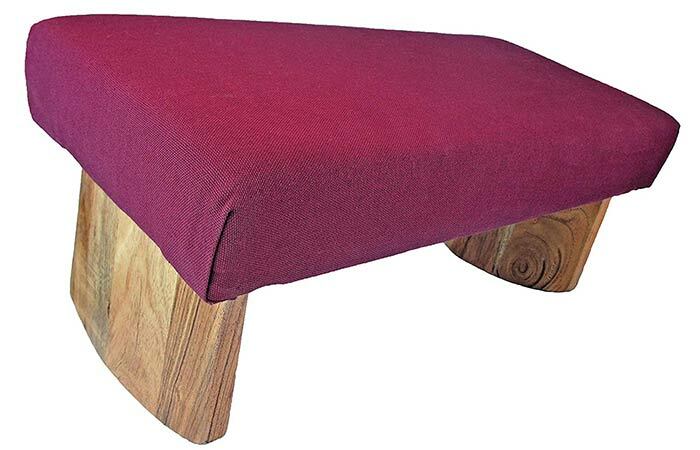 This meditation cushion is designed to avoid numbness in legs. It makes cross-legged and lotus poses more comfortable. It helps keep the spine perfectly aligned by supporting the tailbone. It is lightweight and portable. The higher cushion supports the pelvis. The floor cushion doesn’t stay in place. 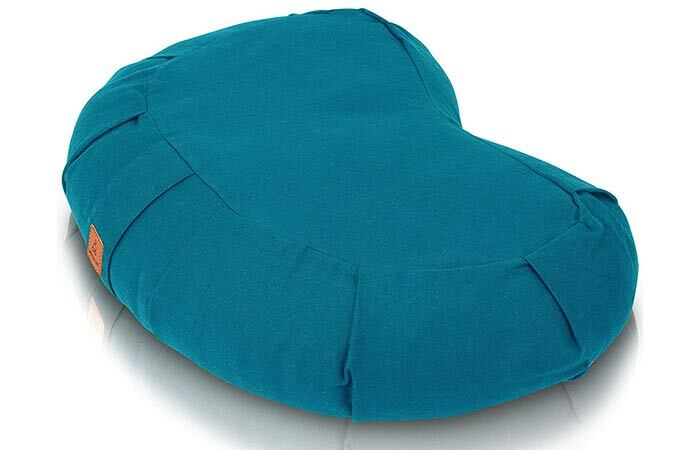 This meditation cushion can be folded and unfolded based on your comfort. It supports your ankles, knees, and elbows. It can be used in various yoga (inversion) positions. It eases the poses and eliminates discomfort. This cushion can be of great help for those with tailbone issue. It is filled with 100% organic kapok fiber. Those were the nine best medication pillows you can try out. But, before you buy a meditation cushion, there are certain points to consider – why you need a meditation cushion and how to choose the right one for you. We have discussed these points in the next section. Besides causing pain and discomfort, sitting for long hours on a hard floor can misalign your back. A meditation cushion improves your posture by elevating your pelvis, raising your hips above your knees for the perfect curvature of your spine. It also helps you concentrate as you will be less distracted due to pain. It helps you reach a deeper meditative state by supporting every pose. If you often travel or prefer meditating in different places, a portable meditation cushion is your best bet. Travelers can also consider buying an inflatable meditation cushion. Any set that comes with a carry bag or a handle fixed to the cushion makes it easier for you to bring it along to classes. Most meditation seats or benches are inconvenient to carry as they do not include a handle. 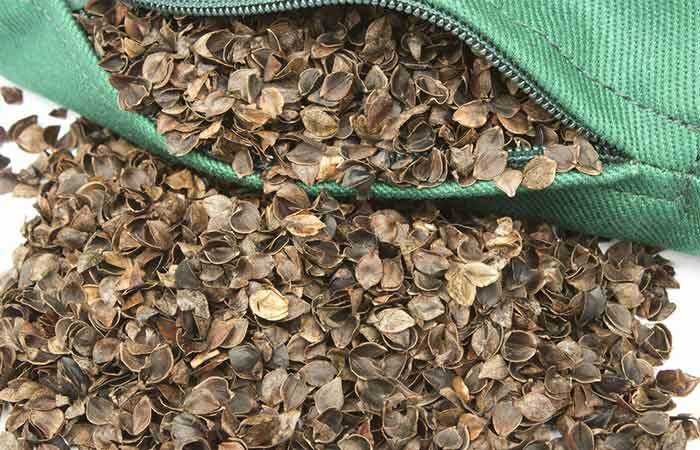 These grain-like seeds provide a firm grip and conform to your shape by shifting according to your movements. Buckwheat hull is incredibly durable and lasts for up to 10 years. 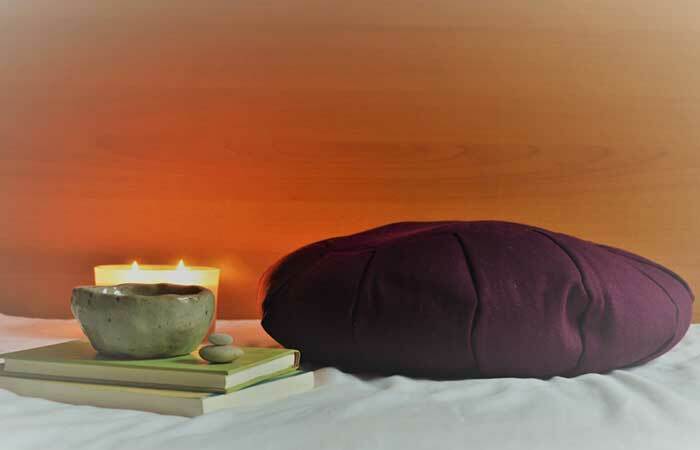 Most meditation cushions have buckwheat fillings due to its stability. These are heavier than cotton and other fillings and easy-to-maintain. Cotton is usually preferred for its softness and flexibility. It is breathable and allows air circulation without retaining moisture. It is lightweight and portable. It is hypoallergenic and is ideal for those who have sensitivities, body sores, and allergies. It is washable and survives abrasion. But, cotton has a risk of developing mildew and molds in a humid climate. Also, it can lose its fluffiness with time. This is the most common filling used for thousands of years. It is softer and lighter than buckwheat. The texture is somewhat similar to cotton. But the cons of kapok are that it flattens with use and becomes lumpy over time. These are artificial, human-made fillings made from fossil fuels. Be clear about the use of the cushion while considering its size. Do you plan on carrying it to the class? Will it have its permanent place in your room? Do you have a space to store the cushion? Look for the dimensions before buying the product. If you are considering height, decide how high off the ground you prefer to sit. There are benches, seats, and other cushions with elevated height. Ensure to choose a soft and durable material that is comfortable on your skin. 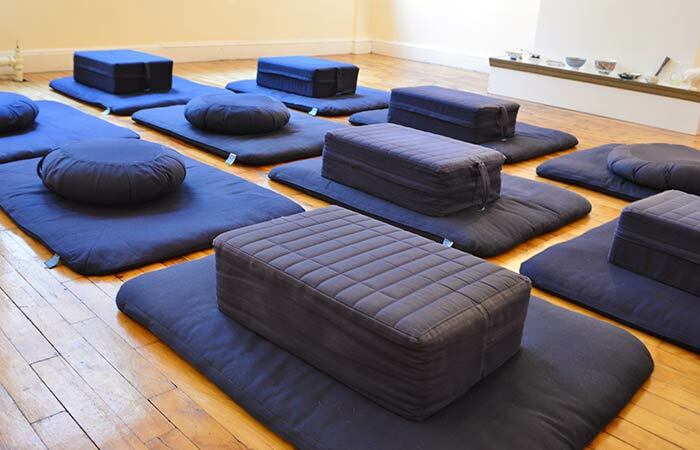 Here are some common choices for meditation cushion covers. Zafu and zabuton are the common meditation cushions found in the market. Let’s take a look at them. The word “Zafu” translates to “Sewn seat” in American English. 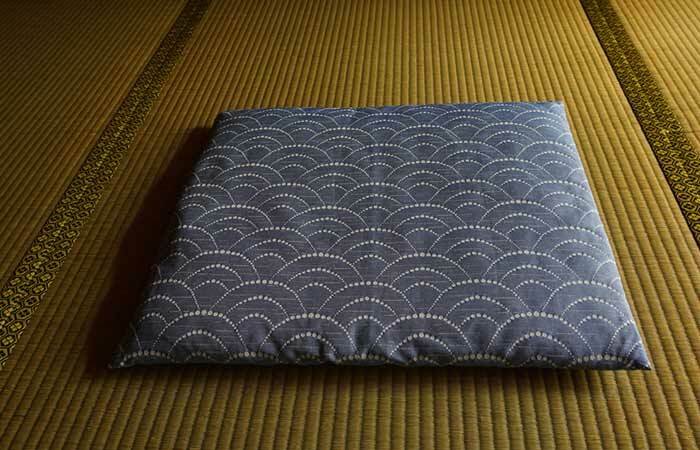 It is a traditional meditation cushion used by Zen Buddhists. It is a round or moon-shaped cushion that helps raise your hips to an ideal sitting position. 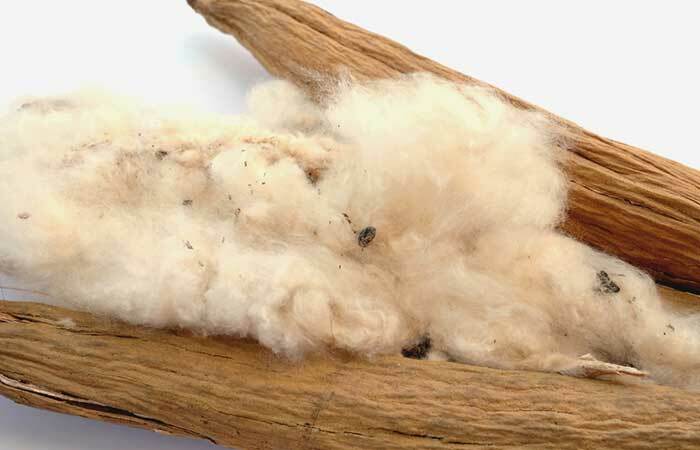 It can have various fillings like buckwheat hulls, cotton, or kapok. Typically, these measure 14 inches in diameter and 8 inches in height. This is a flatter cushion, often used in full or half lotus postures. Usually, it is designed to go underneath a zafu to protect your ankles from numbing. It relieves pressure in the knees and feet and allows you to sit in pain-free Vajrasan (meditation position). It is not as elevated as a zafu. Zabuton is more like a mat with a stable base. These are firm benches with heavy-duty hinges. They relieve stress in the joints and spine. They have two wooden legs supporting the cushion. These chairs increase your capacity to sit on the floor. For those who require back support in lotus or cross-legged position, a meditation chair can be a good investment. It helps relieve back pain for beginners in prolonged meditation. Having the right meditation cushion can help you feel comfortable and motivated to engage in prolonged meditation. Invest in a good meditation cushion that supports your well-being in the long run. Choose a product from the list using the guidelines discussed above and make your meditation a pain-free and effortless experience. Let us know which product worked well for you in the comments section below. Shiva Meditation – What Is It And What Are Its Benefits?